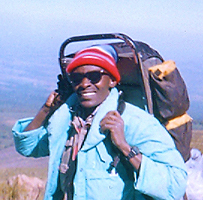 Trekmountkenya.com is owned an operated by Mr. Benson Njoroge Nduba. All trips are arranged and managed by Benson and guided by experienced Kenyans who live in Nairobi and the surrounding area. When Benson is not trekking Mount Kenya, he works as the pastor of a small church in Nairobi. He was recently married to his beautiful wife Hannah.